This week, Ben and the women headed to the Bahamas! And they definitely didn’t disappoint in the drama department. This week, Ben had a one-on-one date, a group date, and a two-on-one date. The first date was a 1:1 with Caila (her second “date”). Ben took her out on a boat where they hung out, lounged around, did some deep sea fishing (with some very unattractive and crazy-looking equipment), swam, and more (I’m sure). I’ve liked Caila from the beginning, but that went a little a lot downhill during her and Ben’s dinner date that night. Ben really wanted to get beneath the surface of her smiling ways that night and she was taken aback by being asked on the spot to be vulnerable. She told him that she feels like she’s in love with him because she “feels understood” by him and that’s all she wants out of life – but not before totally throwing him and everyone else in America for a loop by saying she wasn’t sure if she was really ready and didn’t know why she couldn’t really open up to him. Confused: party of everyone. …to another incredibly weird and awkward date/situation. Becca, JoJo, Lauren B., Becca, Lauren H., Leah, and Ben headed out into the beautiful waters of the Bahamas TO SWIM WITH PIGS on a group date. Apparently, swimming with pigs is “a thing” to do in the tropics. Just another thing I don’t understand, I guess. Those pigs were seriously aggressive towards the chicken hot dogs – and just look at poor JoJo. HA! All of the girls were into it and participated, but some of them went total baby fever and ran to the beach to pick up/play with the sweet baaaabieessss! Once the piggies calmed down and things seemed to chill out a bit, we got to see an awkward procession of Ben swimming up to each girl and wondering why things were so “awk-o taco“. Umm, maybe because you were totally drooling over Lauren B. and the girls didn’t enjoy watching y’all’s show? Or maybe because you had them swim with pigs in the Bahamas? Or mayyyybee because going to an isolated island on a group date to do nothing but “swim with/feed pigs” leaves literally zero options for the other girls to do while you’re spending alone time with each one?? Seriously. What are they supposed to do? There’s no bar to go chill at. There’s no one else around to people-watch. There’s NOTHING to do but to awkwardly stand around and/or swim while you’re ogling on one girl after the next right in front of them. So, Ben addresses the awkwardness that night at the cocktail party for the group. Becca admits that it was difficult to watch him have such chemistry with Lauren B., and then Leah goes for revenge and totally throws Lauren B. under the bus and lies. She tells Ben that Lauren B isn’t the same girl with him that she is in the house and she’s putting on a front. Ben brings this up to Lauren B who has no rebuttal because she is totally blindsided and has no idea why someone would say that about her when it wasn’t true, and then Lauren B cries to the girls. Then Leah blatantly lies to Lauren B’s face telling her that she didn’t say her name or anything to Ben. LIAR FACE. But, Leah’s just mad because she hadn’t had a one-on-one date with Ben yet and he’s made no effort to really get to know her. Which means she should totally take the hint and realize that he doesn’t want to get to know her better. However, Ben gives the group date rose to Amanda because she’s sweet and genuine and has been so kind from the beginning. I just love her and was super happy with his decision. But back at the hotel that night, while Lauren B and Amanda go over all the group date drama with Emily, Leah sneaks out to Ben’s room for some alone time. But instead of taking advantage of said alone time (home girl pretty much created a one-on-one date for herself), she threw the time away and decided to further trash talk Lauren B. But Ben wasn’t going for it and ultimately said goodbye to Leah that night. Adios, crazy! HA! Ben whisks the girls away to a private island on a super windy/stormy day – to do nothing but sit on the beach. Alone. With nowhere else to go and nothing else to do. Read: more totally awkward scenes. And I really felt sorry for both girls because it looked seriously cold and they were both wearing bathing suits and shorts. The weather definitely decided not to cooperate with them! I was kind of sad that Ben didn’t change his plans and take them somewhere else. But I digress. Ben first chatted with Olivia, who only talked about herself…a lot. She then suddenly blurted out to Ben that she’s in love with him, but he didn’t seem too happy about the revelation. So he then went off to talk with Emily and about how much she’s grown since her twin was no longer attached to her side every second of the day and about how Emily wants to grow more with him, etc. etc. They join Olivia back at the beach where Ben picks up the rose that’s awkwardly just chillin’ in the sand. He then grabs Olivia and walks away, leaving Emily to think she’s been defeated and that Olivia was getting the rose. BUT NO. Instead, Ben tells Olivia that he cannot reciprocate her feelings and says goodbye to her. He then walks back over to Emily and she’s elated, accepting his rose. And they drive away in the boat, leaving Olivia stranded on the island. And the cameras stayed on her for what seemed like forever. And then I felt (kind of) bad for her. But she also kind of deserved it. We were then shown a glimpse of what the rest of the season will hold – D.R.A.M.A. and lots of crying, even on Ben’s part! Oh my. But here’s to the final six! I don’t think this comes as any surprise, but I’m not a huge football buff. I mean, I know the game and watch from time to time, but I don’t have a favorite NFL team or watch every single game. However, the Super Bowl is different, right? I mean, everyone watches the Super Bowl. It’s THE BIG GAME and whether you’re a fan of either team or not, you watch. At least, I did. And while the game was intriguing in the beginning, I soon lost interest. Like, by halftime. Apparently, it was a “defensive game” according to Cory and I wasn’t too thrilled. Ha! So instead, I focused on the entertainment factor (i.e. the commercials and halftime show)! (I still watched the game until the very end plus the post game show, but I just paid more attention to the commercials – keepin’ it real!) And first, let’s talk halftime show. 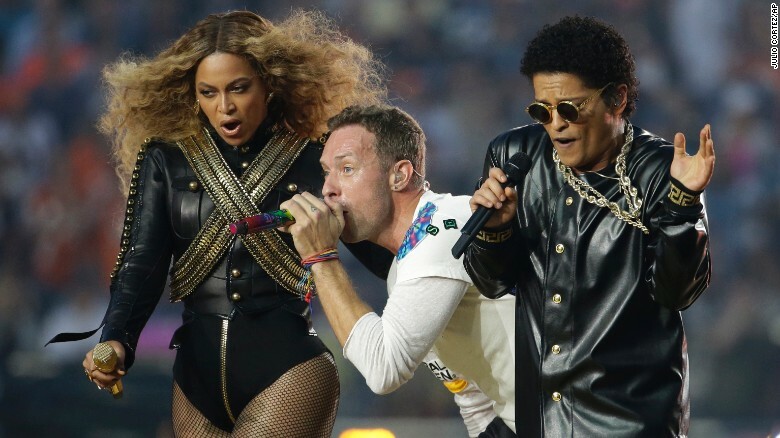 I was pretty pumped about Coldplay performing this year’s halftime show. I mean, it’s old(ish) school and rock and I just love me some Coldplay. But WHAT THE HECK HAPPENED?! They didn’t really get to play their stuff and the rainbow theme just threw me. I know they were doing a “past, present, future” thing, but seriously? This girl was highly disappointed in their performance or lack thereof. And I wasn’t alone. I found some fellow disappointees in the Twitterverse that agreed with me and we threw a fit together. And then, Bruno Mars came out, and my spirits were lifted a bit. For like, ten seconds. 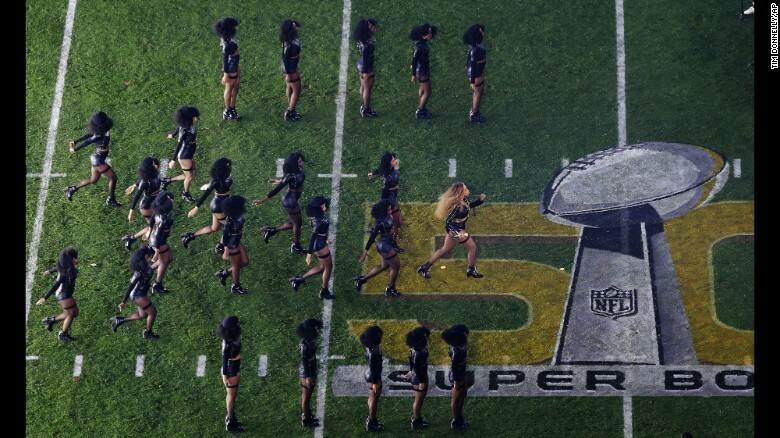 And then, Beyonce stormed the field. She played her song, “Formation” that apparently only debuted on Saturday, the day before the Super Bowl and danced her way to the stage. Home girl has killer moves, we all know this, but why on earth would you perform a song that almost no one knows? It might just be me, but I found this a bit strange. BUT, she did kill it! So there’s that. And she was awesome (even when she almost fell but totally played it off because she’s BEYONCE #smoothmoves). And Bruno was awesome. And Coldplay should’ve been awesome. But the whole thing just felt disconnected. It jumped from one to another to another and then they threw it all together in the end…and it just felt weird. Am I the only one?? 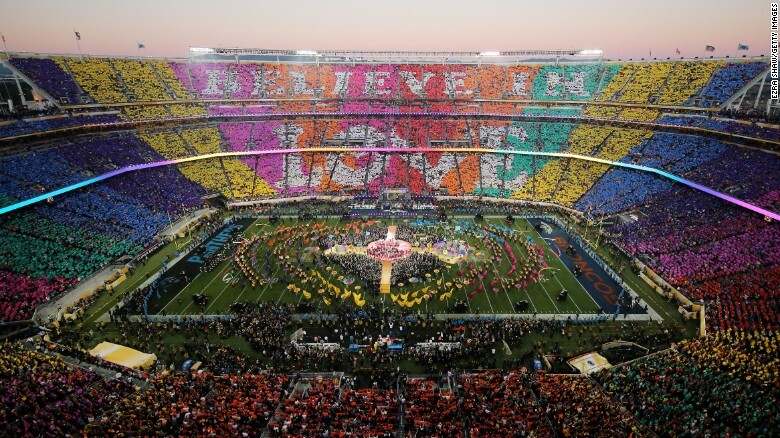 I’m going to wrap it up in that I was highly disappointed because when I heard that Coldplay was doing the halftime show, what actually happened was definitely not what I was expecting. If you enjoyed it or understand some deeper meaning of how this all pulls together, please share! I’m definitely open to it. Because I just don’t get it. And now, let’s talk commercials! The Schick commercial was spot on. It was a super cute way to showcase their razor against an inferior one. It wasn’t super deep or knee-slapping funny, but I really liked it! Just watch. I don’t know if it’s because I’ve worked with victims of violent crime for the last 4 years, but this commercial really stood out to me, and I’m seriously thankful for it. I know there’s some talk about how it could have and should have taken domestic violence a step (or two) further (see here) – but progress is progress and I’ll take it. Ok, this one – I’m dying! I laughed at this one and seriously loved those Queen-singing sheep! And I also love the idea of a bed audio system! That brings a whole new level to tailgating, spending a night under the stars, washing your truck, etc. LOVE it! Okay, this one was seriously funny! I wasn’t too sure at first, but I’ve watched it numerous times and it’s hilarious. I admit it! I’d do anything for Doritos, too, kid! HA! This one gave me ALL THE FEELS. Like, in the gut. Emotional and sad and then the “awwww” moment. A must watch and definitely powerful! While Budweiser disappointed fans this year by not incorporating a cute puppy (apparently, puppy ads don’t sell beer very well), they did bring forth a seriously strong message in one of their commercials, which I LOVED. Like, I don’t think I could love it any more. Let’s just listen to what Helen Mirren has to say…and pay close attention. What were your favorite commercials this year? Did your favorite team win the big game?